In my previous post I started to report on our activities at the European Conference of Educational Research (ECER 2018) that took place last week in Bolzano/Bozen. 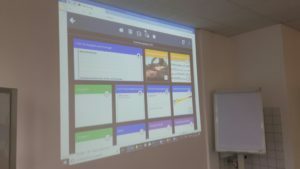 In the first post I concentrated on the sessions that focused on the use of Learning Toolbox (LTB) as a digital toolset for preparing and presenting ePosters in conferences. 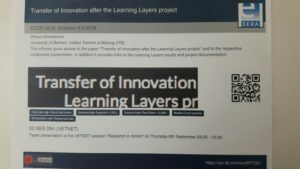 In this second post I will concentrate on my own contributions that focus on the follow-up phase of our EU-funded Learning Layers (LL) project and on the issue ‘transfer of innovation’ after such a project. Firstly I will discuss my presentation on the research background of the LTB – prepared for the EERA session on using the LTB for ePosters. Secondly I will discuss my paper presentation on the theme “Transfer of Innovation after the Learning Layers project”. However, this time I don’t want to provide simple summaries of two presentations. 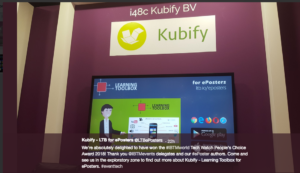 After all, we were at #ECER2018 with a pilot project in which the poster authors were trained to convert their traditional posters into ePosters with the help of LTB. So, I also took our own medicine and transformed my ‘ordinary’ PowerPoint presentations into hybrid presentations by using the LTB. Therefore, I want to give insights into the ePoster-versions of my presentations and what all has been packed into them alongside the initial PowerPoint presentations. Let me firstly give the link to the EERA showcase, where they can be found among others. Then we can have a look at each of the two presentations individually. 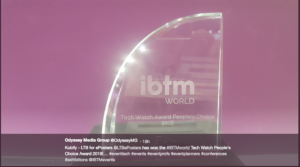 The ‘ordinary’ ppt-presentation gives insights into the Learning Layers project, into the co-design activities in the Construction pilot, into the shaping and pilot testing of the Learning Toolbox (LTB) and into the reporting of the results. Then, the presentation gives an overview of research themes with which I have tried to put the innovation agenda into a wider context. And I have added a lot of references to relevant literature. In my ‘ePoster-version‘ I have prepared an LTB-stack and told my story with few tiles that accommodate text documents. In addition I have used other tiles to link to web documents for presenting our project documentation and reporting. Then, on further screens I have given access to my research papers and to videos presenting our application partners’ views. In this way the ePoster-version provides a richer resource environment on the background of the LTB. Here, the ‘ordinary’ ppt-presentation gives some background information on the Learning Layers projects, on the co-design and pilot activities in the Construction pilot and describes the transition to the follow-up phase. Then, the second part discusses the ‘transfer issue’ as it was analysed in the light of earlier German Modellversuche, in more recent innovation programs and in specific pilots to promote transfer via ‘encounters’ and joint search processes. The presentation makes some comparisons between these earlier examples and our present situation. And here again, we have some literature. In my ‘e-poster version‘ I have prepared a simple LTB-stack with two screens. The home screen gives access to the ppt-presentation and to the full paper and to my author information. The additional resource screen gives access to essential web links: the reports on Learning Layers results, the documentation of the Construction pilot as the “LTB-Chronicle”, the EERA-showcase with other ePosters. And concerning the literature, it provides two content tiles – literature on the transfer issue in Modellversuche (only paper-based) and my research papers uploaded on ResearchGate. In this way the ePoster-version has provided a somewhat richer resource environment. I think this is enough of my contributions. 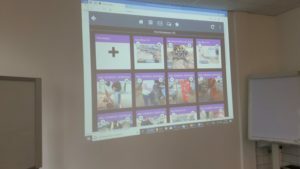 I hope that this blog post helps to get access to the ePosters and to the resources they make available. If that is the case, it was worthwhile preparing them. But this is not all about the #ECER2018. As I have reported in my previous post, we had invited all authors who had proposed posters to be presented in the VETNET (Network 2) program of the ECER 2018 to prepare ePosters and to present them in an Interactive Poster Session in the VETNET area. We were pleased that all authors had agreed and that we had their ePosters ready in the EERA showcase prepared by the LTB developers. However, we had very little advance information on the venue and very little time to prepare the room for the session. Thus, the best we could do was to organise a similar session as an ‘ordinary’ paper session – but now presenting ePosters. A major difference, however, was the fact that we had a full set of mini-posters presented on ‘poster wall’ in the session room before the session and it remained after the session. We had an additional difficulty in the fact that the EERA session was scheduled immediately after the ePoster session, so we had to organise the presentation and discussion on six posters in a tight time frame to get in time to our next session. For this purpose we grouped the presentations into pairs that had some commonality in their themes. Here again, our authors were flexible and the arrangement suited them. Firstly. 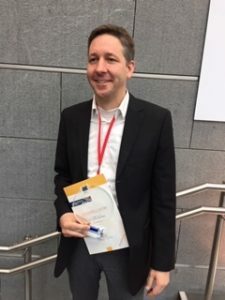 Wilko Reichwein presented insights into the cross-university cooperation in shaping vocational teacher education by linking subject disciplines and pedagogic know-how to each other. Then Marta Virgós Sánchez provided insights into the implementation of ‘dual’ training models in Spain. 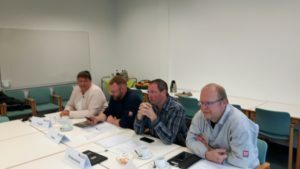 Cooperation between learning venues (Lernortkooperation) was discussed from the perspective of educational planning (the German presentation) and from the perspective of feedback from the parties involved (the Spanish presentation). Secondly, on behalf of a Hungarian research team Marta Takacs Miklósi and Attila Karoly Molnar presented their comparative studies between the preconditions for education, training and learning in the prisons in Hungary and Poland. Then they presented insights into the learning opportunities and the role of andragogy (adult-oriented support for learning) in Hungary and Slovakia. Thirdly, Maria Christidis gave insights into the communication culture and learning culture within the training of nurse assistants in Sweden. Then Katharina Peinemann provided insights into the inclusion issues in the German pre-vocational learning provisions (the ‘transitional system’ ) and into challenges for teachers’ professional development. Altogether, we suffered from the time constraints, but we could stimulate some discussion. 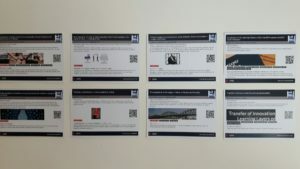 And since the authors could stay a little longer at the ‘poster wall’, they could advise interested participants, how to upload the richer LTB stacks (with the help of the QR-code) to mobile phones and get further information. 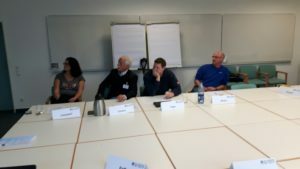 In the discussion we had feedback from the authors of the VETNET ePoster session and further questions from representatives of other networks. Also, we got several questions concerning the use of LTB as support for practice-based learning in vocational and higher education. We still have a lot of impressions to digest and a lot of points to be made to EERA as conclusions on our pilot project. I guess this is enough of this pilot project. But I will keep the topic ‘ePosters’ present when I give an account on my own presentations. I also did my homework in preparing ePosters although I presented in somewhat different sessions. 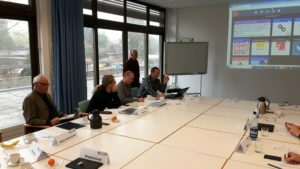 One of the most successful spin-offs from our EU-funded Learning Layers (LL) project has been the use of the Learning Toolbox (LTB) in conferences to prepare ePosters. As regular readers of this blog know, I have covered the work of the project and its construction pilot since 2012. 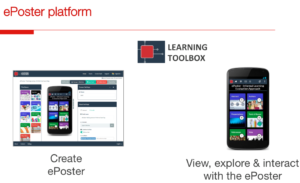 And in the recent years (during final phase of the project and in the follow-up phase) I have written a lot of the flexible mobile toolset that was named “Learning Toolbox( LTB)” since it was designed to support vocational and workplace learning in the construction sector. 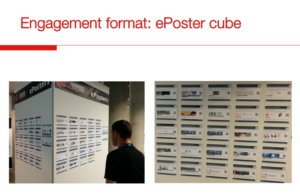 BUT one of its most interesting applications has been the preparation of ePosters as an alternative for traditional paper posters. 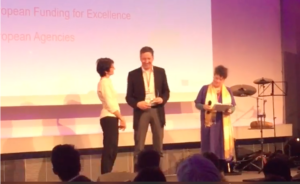 And, as I have written (somewhat enviously), our colleagues have been successful in introducing it to conferences of medical educators (AMEE), dentist educators (ADEE) and educational technologists (EC-TEL). However, now it is the time to announce that LTB will be introduced into our field – to the European Conference on Educational Research (ECER) in the annual conference of the European Educational Research Association (EERA) that will take place in September 2018 in Bolzano/Bozen in Italy. Below I will give a brief report how this has come into being and what we are doing next week in the conference. During the preparation of the ECER 2018 we (the VETNET network) prepared two proposals. Firstly, we proposed to have a specific EERA-wide session to promote awareness on the usaes of LTB for shaping ePosters in research conferences. Parallel to this we prepared a proposal for an EERA-funded “Network project” to be implemented by the VETNET network. 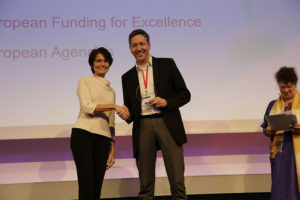 Both proposals were linked to the idea to organise an interactive VETNET poster session in which the authors would presented their posters as ePosters within the VETNET programme. We were happy to see that the proposals were approved by the EERA authorities and that we could go ahead with the initiative. During the preparation phase the LTB developers prepared a special web page “FAQ ECER” in whch they gave all possible advice for the conference participants who had proposed posters for the ECER programme. 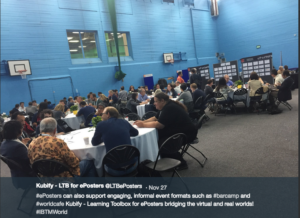 With short instruction videos and with a well edited Webinar recording the authors were advised, how to enrich their original posters into ePosters by using the LTB. 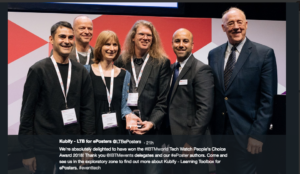 During the last few weeks we have made the positive experience that all authors have been able to make use of the LTB and prepared their own ePosters. Now they are available on the page “EERA showcase“. In addition, I have prepared my presentation for the EERA session (on the research background and usability of the LTB) also as an ePoster (or hybrid presentation) using the LTB. 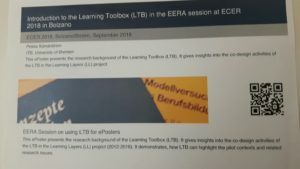 And furthermore, I have prepared my presentation “Transfer of Innovation after the Learning Layers” also as an ePoster (or hybrid presentation) with the help of LTB – or as we could call it in this context “the EERA-Toolbox”. 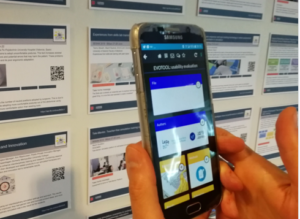 So, we have done quite a bit of work to bring the ePosters to the ECER 2018 and to demonstrate that the EERA could follow the example of other conference organisers. We are eagerly looking forward, how our pilot sessions will be received and what kind of feedback we will get from the authors and the audience. I will surely report on that in a short while.